Youand your Valentine will enjoy an evening of romance set to the live musical backdrop of celebrated jazz vocalist Jaimee Paul, along with an elegant dinner and dessert menu prepared by Fontanel Head Chef John Williams. 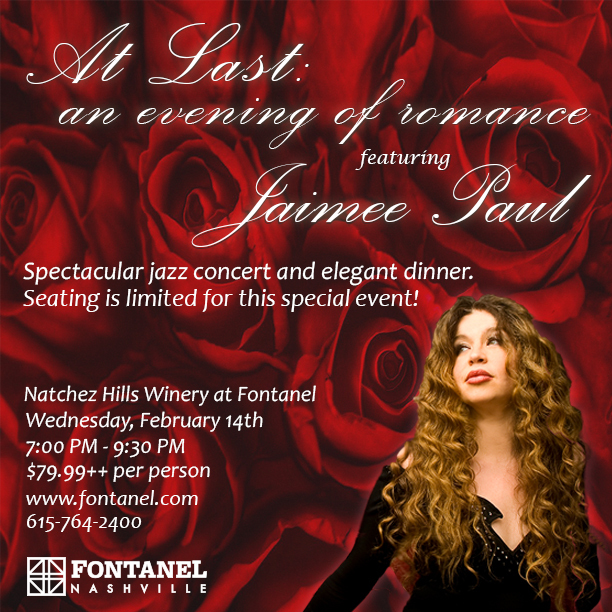 In beautiful Natchez Hills Winery at Fontanel, you and your Valentine will enjoy an evening of romance set to the live musical backdrop of celebrated jazz vocalist Jaimee Paul, along with an elegant dinner and dessert menu prepared by Fontanel Head Chef John Williams. Jaimee Paul and her band of accomplished jazz musicians, including Leif Shires on trumpet, have designed an extraordinary program for this very special Valentine’s event. Seating is very limited. Each couple will be seated at their own private table. Couples who wish to dine with other guests, please email emma.hamilton@fontanel.com. – Salad course featuring fresh burrata, toasted pistachios, crisp ham, roasted tomatoes and basil with a sherry wine vinaigrette. – Main course featuring petit beef filet, dauphinois potatoes, oil-roasted asparagus, and roasted corn jus. – Dessert course featuring a decadent triple chocolate cake with peanut butter mousse garnished with chocolate pearls. Wine, beer and cocktails will be available for purchase. Cocktail service will be available table side as well as at the full bar. 6:45 PM – Doors open. It is not necessary to arrive prior to doors opening, as seating is preassigned according to purchase order. 7:00 PM – Dinner is served. 7:30 PM – Concert begins. 9:30 PM – Evening concludes.